LOCAL candidates have welcomed the decision to suspend the general election campaign following a suspected terrorist attack which resulted in 22 people being killed at a concert in Manchester on Monday night. 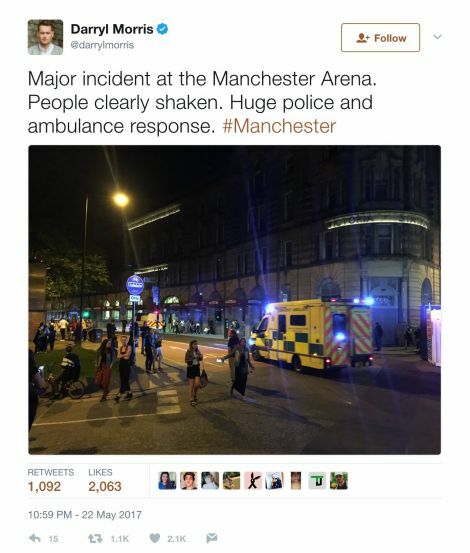 Police are treating the apparent suicide bombing, which took place in the foyer of the Manchester Arena during a concert by American pop star Ariana Grande, as a terrorist attack. Shetland Islands Council’s deputy convener Beatrice Wishart said: “Our thoughts are with all those affected by last night’s attack at the Manchester Arena, especially the families and friends of those who have died or are injured or missing. He added that the local authority would probably write to Manchester’s mayor Andy Burnham to express condolences. All of the main party leaders agreed to suspend campaigning ahead of the 8 June election. Liberal Democrat candidate for the Northern Isles Alistair Carmichael said: “The decision to suspend the campaigning is absolutely the right one. This is a time when political parties should be focusing on what unites us rather than our differences. He added that the attack itself, occurring at a pop concert aimed at teenagers, was “the latest in a long line of horrific and depraved incidents”. SNP candidate Miriam Brett described the news as “horrifying” and confirmed the party’s planned manifesto launch on Tuesday had been cancelled. “My thoughts are with the victims, their loved ones, and those helping in our emergency services,” she said. Conservative candidate Jamie Halcro Johnston said: “My thoughts are with the family and friends of all those effected by this appalling attack. To target an event at which the audience was largely children and young people is barbaric and the height of cowardice. “It’s also important to recognise the work of the emergency services – the police, paramedics, docters, nurses, firemen, first aiders and the many others who will have had to cope with what must have been such a devastating scene with so many distressing cases. “Manchester was the scene of the attack. But the victims will likely have come from across our country. It’s an attack on us all and we must stand together to ensure the terrorists won’t win”. Labour candida Robina Barton confirmed her party has “suspended campaigning due to the awful events in Manchester”. Independent candidate Stuart Hill said: “My heart goes out to the victims of today’s bombing. Orkney and Shetland is a small constituency and you cannot imagine something like that happening here – even on a comparative scale.